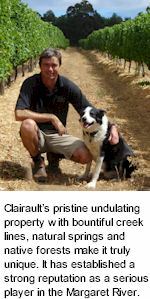 Owned and operated by the Martin Family, Clairault is a wine grower dedicated to nurture an appreciation of quality that is enjoyable and life enhancing, an aspiration which underpins their approach to all they do and how they relate. Biological farming is the passion, a mix of organic and conventional farming techniques that place a strong emphasis on soil biology. These techniques result in high quality crops, while using significantly less herbicide, no insecticides and no synthetic fertilisers. The biological farming, sustainable and low intervention techniques ensure that only the purest of fruit is produced, thus achieving optimum flavour. Cabernet Sauvignon, Merlot, Chardonnay, Sauvignon Blanc and Semillon are the dominant varietals grown on the estate and have proved worthy time and again. The 230 hectare property contains four dams, approximately 85 hectares of remnant bushland, 40 hectares of grazing land and the upper reaches of the Gunyalgup, Quininup and Big Brook which joins the Wilyabrup Brook. The remnant bushland comprises jarrah, marri and banksia open forest with small areas of peppermint closed forest found near the creek lines. Clairault strive to create a living heritage of wines that reflect the uniqueness of terroir, wines that are consistent in quality, well balanced, of distinct and lasting elegance, and which express purity of fruit. This approach, combined with minimal intervention winemaking practices and exceptional quality estate grown grapes, achieves the best wine Clairault has to offer. The winemaking team at Clairault have been endowed with a beautiful, pristine land from which to extract harvests of the finest fruit. With this land comes responsibility to preserve and where possible improve the biodiversity and environmental integrity of the site. It is the aim and desire to keep to a minimum any impact on the quality and sustainability of land, water resources and the wider environment. Clairault is now a specialist in old vines, producing finely aromatic wines in a crisp and distinctive style, full of fresh fruit and offering pleasurable current drinking. As the wines continue to receive an increasing number of accolades from international shows, national shows and wine critiques, Clairault wines are winning friends from around the globe. At the 2009 London International Wine Challenge, Clairault’s flagship 2005 Estate Cabernet Sauvignon won Gold and Double Trophy for Best Cabernet in Australia and Best Western Australian Red Wine. Clairault has also earned an enviable reputation as one of the region’s most popular tourism destinations. Set in exquisitely breath taking surroundings, the tasting room overlooking the vineyard and winery is the ultimate way to experience the fruits of the winemaking team's labour. Clairault Winery and Vineyard is situated approximately 10 km south of Yallingup within the Wilyabrup locality of the Margaret River Wine Region. With the guidance of Freshcare Environmental Codes of Practice and Entwine Australia Sustainability Accreditation, Clairault identify, quantify and minimise any impacts from their efforts on the land and local fauna through a programme of continuous improvement. Since 1976 they have been using sustainable practices in the vineyard and it shows. An outstanding range of distinctly elegant wines that have been recognized with considerable international success.